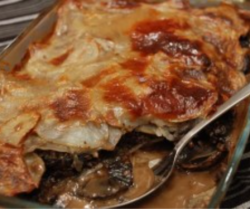 We have just found this amazing recipe for a Mushroom, Black Pudding & Potato Layered Casserole from 41 Feasts, perfect for the family and will really hit the spot. For more amazing recipes from 41 Feast click the link above. Brilliant as a winter warmer recipe or just for a hearty meal. Pre heat your oven to 200 degrees C and butter a medium sized oven dish. Spread your potatoes on a plate and sprinkle with a little salt and pepper. In a shallow frying pan over a high heat, fry your black pudding slices on both sides (you may need a little oil). Melt the butter in a small saucepan over a low heat and add the flour to make a roux. Cook for a few minutes, then slowly add the stock, stirring well to ensure your sauce is lump free. Continue to cook as the sauce thickens, stirring fairly consistently. Season with salt and pepper to taste. Cover the bottom of the oven dish with a layer or two of potatoes. Top with the mushrooms (I removed the stems and them dropped them in the gaps). Cover with another layer or two of potatoes, then the slices of black pudding. Top with the remainder of the potatoes and gently pour your sauce over the top. It should fall through the layers. Make sure the top layer of potatoes are covered in sauce. Bake in the oven for 40-50 minutes until potatoes are cooked.